Block & Tackle began the 2014 season with a salute to bad announcers, but now I’d like to praise good announcers. Strange, I know, but bear with me. The broadcast team for a football game has two basic jobs: narrate and illuminate. There are other jobs—like begging you to join Emmy winner Jim Parsons and the rest of the gang on a new Big Bang Theory tomorrow at 8/7 Central—but those are the main two. The play-by-play announcer turns the game into a story as it happens, and the color commentator, typically a former player, sheds light on hidden aspects of the game. That’s how it’s supposed to work, but breakdowns happen all the time, especially in terms of illuminating the game. The need to maintain three hours of near-constant patter—the vocal white noise that pacifies unruly home viewers—means that color guys often have to talk when they have nothing to say. Handling that inevitability must be part of a top-tier color commentator’s skill set. To recap: Simms poses a question. Simms says the question is a trick question that cannot be answered. Simms answers the question anyway. Simms rebukes himself for answering the question. And just like that, it’s time for the next play. Bad announcing is a skill. I’ve heard thousands of pre-snap quarterback cadences over the years—it’s a vivid part of a game’s sonic tableau—yet I almost never hear announcers explain what we’re hearing. (There was the collective media swoon over Peyton Manning’s “Omaha” calls last season, but in that case the commentary largely amounted to “He sure does say that word a lot!”) It’s rare because it’s hard. These cadences come shortly before a play begins, which leaves only a brief opportunity for an analyst to offer his insight. In the play above, Gannon starts to break down “56 Lucy” with six seconds left on the play clock, which means that he has that much time, at most, to shed light on details that took me a whole paragraph to tease out. Gannon’s explanation is abridged, sure, but deftly so. He takes a second to describe what “mike” means, for instance, because the meaning of that term isn’t immediately evident. But he doesn’t bother to elaborate on “slide left,” which sort of explains itself. Gannon has the needs of his audience in mind the whole time. That’s good announcing. 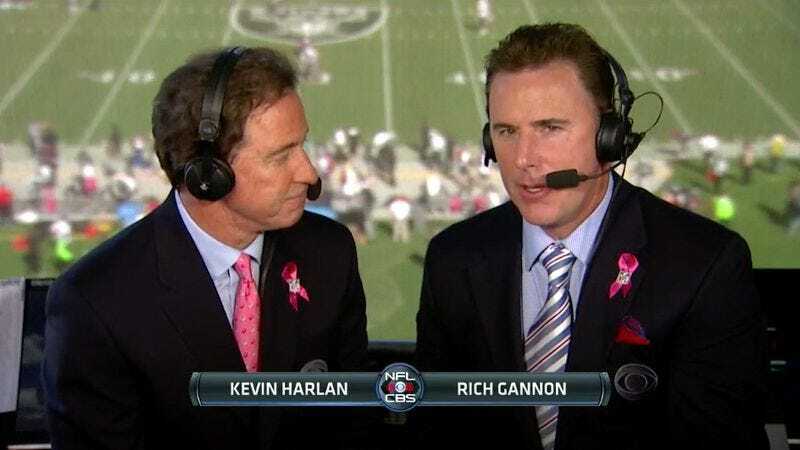 I don’t want to give short shrift to the assist by Gannon’s play-by-play partner, Kevin Harlan. As soon as Gannon remarks on “56 Lucy,” Harlan immediately asks, “Which is what?” It may seem like an obvious question, but that’s just it. Play-by-play guys often fail to ask obvious questions about the action on the field, presumably because doing so would be a tacit admission of ignorance. (They will ask about bland inside-the-huddle stuff—“If you’re the Titans, how do you regroup, headed into the locker room trailing by 14 at halftime?”—but that’s just standard-issue narrative-building, and it rarely yields surprising insights.) One rule every decent interviewer learns is that you can’t be scared that you’ll look dumb if you ask simple questions. Here, Harlan is unafraid to express his curiosity, and as a result, he and Gannon make their broadcast smarter. Good announcing brings the game to life in unexpected ways, and we ought to celebrate it. If you spot an instance of good announcing that you’d like to see featured in Block & Tackle, tweet it to me @johnteti. If you can, include the game and the time when the announcers covered themselves in glory, which makes it easier to make a clip. (This goes for you sack-dance and touchdown-dance spotters, too.) The era of laughing at crummy announcers will never be over, thankfully, but maybe we can usher in an era of announcer love, too.